What is inspiration to me? A force or influence that inspires... Today's post is just that! 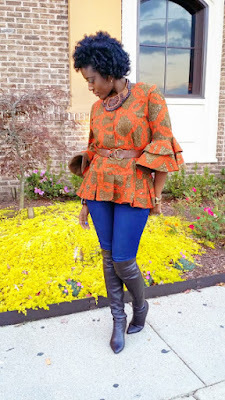 I ran across the stylish Style is She and admired her Fab ensemble. 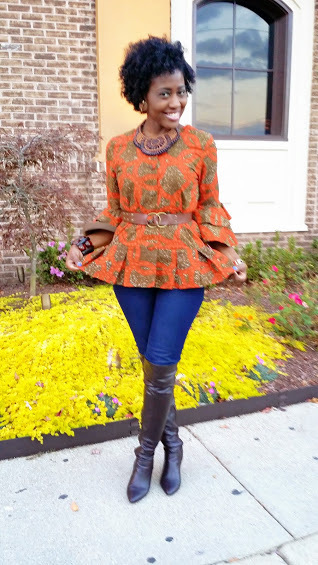 Not only was I in ahh, but I adored how classy and chic this African Print peplum inspired look really was. Inspired = Style Snatchin! I scored this vintage African print inspired peplum from Thrifting Atlanta Fashion Week fashion swap this year. I had been contemplating on how, when and where would I wear this look... Never the less here we are! There was nothing special about this day oooo just casual day at work. Yep I said work. It is amazing what great pieces you can score being a Thrift Queen. Who thrifts #shethrists as NeShanta would say! Join her on Instagram for #Shethrifts Thursdays! Take a look at my ensemble... I wanted to stay true to my roots by accessorizing my look with wooden pieces. I had just the perfect look! Of course a girl gotta rock her "JEWELZ"! Click the link and get your Jewelz fix!